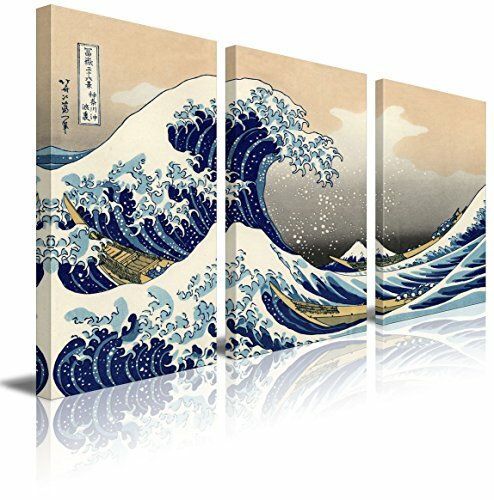 wall26 - The Great Wave Off Kanagawa by Hokusai - Canvas Art Wall Decor- 36"x54"
Looks great. I love it. The stretched canvas makes it a little difficult to appear straight in certain lighting though. Looking at it from the side can make it appear crooked because it's printed on the sides. We played with a bit, moved it around and love it now. Looks great and such a good deal. You really need 3 people when trying to hang them. Really hard on you're own. This was a great price for this art, I used to buy art from Ikea for inexpensive good looking art. This is even a better deal!! Looks great on the wall, and not the worst to hand. The hang clips were very off center, one so much that the very left side of it was where the true middle of that panel was. I just hung it on a nail all the way to that side and put a tac in the lower corner behind it so it couldn't slide over. I have already review another print from this company. Very satisfied with the quality of this product. This and the other I have purchased are beautiful. Plus the prices are very reasonable. If you are interested in Japanese art and culture, I would highly recommend this company's products. Good printing but the canvass was stretched poorly. It arrived on time. My daughter is delighted! This is a high quality piece for the price. The wooden frames are well built and sturdy, and the printed canvas looks good. I didn't find any flaws or issues with the product I received.